When it was first published, Japanese Cooking: A Simple Art changed the way the culinary world viewed Japanese cooking, moving it from obscure ethnic food to haute cuisine. Twenty-five years later, much has changed. Japanese food is a favorite of diners around the world. Not only is sushi as much a part of the Western culinary scene as burgers, bagels and burritos, but some Japanese chefs have become household names. Japanese flavors, ingredients and textures have been fused into dishes from a wide variety of other cuisines. What hasn’t changed over the years, however, are the foundations of Japanese cooking. When he originally wrote Japanese Cooking: A Simple Art, Shizuo Tsuji, a scholar who trained under famous European chefs, was so careful and precise in his descriptions of the cuisine and its vital philosophies, and so thoughtful in his choice of dishes and recipes, that his words—and the dishes they help produce—are as fresh today as when they were first written. The 25th Anniversary edition celebrates Tsuji’s classic work. Building on M. F. K. Fisher’s eloquent introduction, the volume now includes a thought-provoking new Foreword by Gourmet Editor-in-Chief Ruth Reichl and a new Preface by the author’s son and Tsuji Culinary Institute Director, Yoshiki Tsuji. Beautifully illustrated with eight pages of new color photos and over 500 drawings, and containing 230 traditional recipes as well as detailed explanations of ingredients, kitchen utensils, techniques and cultural aspects of Japanese cuisine, this edition continues the Tsuji legacy of bringing the Japanese kitchen within the reach of Western cooks. SHIZUO TSUJI (1935-1993) was the former head of the prestigious Tsuji Culinary Institute in Osaka, the largest school training professional chefs in Japan. The author of over 30 books on gastronomy, travel and music, he was a leading figure in the international culinary community. Japanese Cooking: A Simple Art was instrumental in popularizing Japanese cuisine in the West. 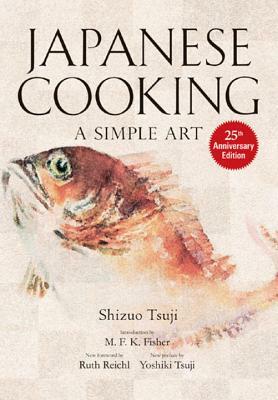 Tsuji was also the author of Kodansha’s bestselling Practical Japanese Cooking.